Shoulder pain can be quite the burden on living a healthy, independent life. We have put together a complete guide to help you better understand your condition and how to improve your overall health! Shoulder pain is a quite common physical therapy condition when you experience a pain in the shoulder region. It can arise from the joint, surrounding muscles, bursa, ligaments, tendons, joint capsule, or labrum. True shoulder pain is typically worsened with activities that place unwanted stress on the shoulder complex (such as lifting heavy objects, reaching overhead, or overuse with poor mechanics). It is not uncommon for other body regions to refer pain to the shoulder (especially in the areas surrounding the neck) or in rare cases for systemic pathologies to present as shoulder pain (such as ischemic heart disease and liver disease, among other things). Whether you live in the Glendale area or in Scottsdale, this guide will help you get back to living a healthy life. There are many times that patients are unsure if they need to see a specialist about a condition or an injury. If you are experiencing any of the following shoulder pain scenarios, please be sure to contact your doctor. When your shoulder pain is associated with chest pain, shortness of breath, sweating, or gets worse with cardiovascular exertion (going up a flight of stairs, jogging, stress). If you experience a familiar pain from a previous injury, it would be a good idea to contact your specialist to make sure that your pain does not continue to get worse. If your shoulder pain began immediately after a fall/trauma and you cannot raise your arm overhead. If your shoulder pain is associated with numbness, tingling, or weakness in your arm. Subacromial shoulder impingement occurs when the top of the arm bone (the humeral head) abuts against the outside of the shoulder blade (the acromion). Patients with impingement typically present with shoulder pain when reaching overhead or across their chest. Treatment – Your physical therapist with evaluate the movement mechanics and address any muscle imbalances that are causing the pain. Early subacromial shoulder impingement is not typically associated with any muscle or tendon tears and can be effectively treated with manual therapy (myofascial release, dry needling, cupping, scraping) and movement re-education (strengthening, endurance training, neuromuscular re-education, activity modifications, etc.). Posterior shoulder impingement occurs when the muscles and joint capsule in the back of the shoulder get caught between the arm bone (humerus) and the shoulder blade (the scapula). Patients with posterior impingement typically report symptoms with overhead motions with their arm in external rotation (like when hitting a volleyball overhead). Treatment – Your physical therapist with evaluate the movement mechanics and address any muscle imbalances that are causing the pain. Early posterior impingement is not typically associated with any muscle or tendon tears and can be effectively treated with manual therapy (myofascial release, dry needling, cupping, scraping) and movement re-education (strengthening, endurance training, neuromuscular re-education, activity modifications, etc.). However, it is important to address posterior impingement early to reduce the risk of developing a rotator cuff or labral tear. Subacromial bursitis occurs when the bursa under the tip of the shoulder blade (acromion) becomes inflamed. This often occurs as a result of prolonged subacromial impingement syndrome. Patients with subacromial bursitis typically present with shoulder pain when reaching overhead. Treatment – Your physical therapist with evaluate the movement mechanics and address any muscle imbalances that are causing the bursa to become pinched and inflamed. Subacromial bursitis can typically be effectively treated with strategies that offload the bursa by improving your movement quality. This includes manual therapy (myofascial release, spinal manipulation, dry needling, cupping, scraping) and movement re-education (strengthening, endurance training, neuromuscular re-education, activity modifications, etc.). The labrum is a piece of fibrocartilage that provides cushion and stability to the shoulder (glenohumeral) joint. Tears to the labrum can occur traumatically (falling onto the arm, dislocating the shoulder) or over time (with overuse or shoulder instability). Patients with labral tears often report deep, aching pain in their shoulder that is worse with use of the involved extremity. A rotator cuff tear is a tear in one or more of the tendons of the four rotator cuff muscles. While this can occur after a fall or trauma, researchers believe rotator cuff tears are a degenerative process, meaning they happen slowly over time. Patients with rotator cuff tears typically report pain in the shoulder when reaching overhead and pain at night when sleeping on the involved shoulder. Treatment – Research shows that the size/severity of a rotator cuff tear does not always correlate to the amount of pain a patient feels. If the tear happened acutely (i.e. after a fall), it is important to seek advice from your physical therapist or orthopedic physician as soon as possible. However, if your shoulder pain has slowly progressed over time, conservative intervention has been shown to be extremely effective in reducing pain and improving the functional use of your involved shoulder/arm. Ask you therapist for more details. Biceps tendinopathy occurs when the tendon of the long head of the biceps becomes inflamed and undergoes tissue changes. This can be the result of shoulder instability or impingement – two very different processes. Treatment – Because biceps tendinopathy can occur in patients with extremely flexible and very tight shoulders, it is important to seek consultation with your physical therapist to ensure you receive the right treatment, as the wrong treatment can make you pain and tendinopathy worse. Shoulder instability is a term that encompases a broad spectrum of severities. It ranges from micro instability to subluxations (dislocation with immediate reduction). Complete dislocations or subluxations commonly cause other injuries (especially to the labrum and rotator cuff). Anterior or multidirectional shoulder microinstability can progress to subluxations if not properly identified and treated. Arthritis in the shoulder occurs when the cartilage in the shoulder is worn down after many years of stress on the joint. Patients with shoulder arthritis report deep, aching pain with all shoulder movements and difficulty sleeping due to their symptoms. Treatment – The surgical options for shoulder arthritis are typically reserved for people with extreme shoulder pain at rest and are limited depending on the quality of the surrounding muscles. The best first step in treating shoulder arthritis is physical therapy with or without injections from the orthopedic MD. Your physical therapist will evaluate the movement mechanics and address any muscle imbalances that have contributed to the development of arthritis. This includes (but is not limited it) manual therapy (myofascial release, dry needling, cupping, scraping) and movement re-education (strengthening, endurance training, neuromuscular re-education, activity modifications, etc.). A muscle strain and occur in any of the muscles surrounding shoulder joint. A strain is typically produced with a single, fast movement (i.e. attempting to catch something with an outstretched arm) and results in pain when the strained muscle is activated. Treatment – It is extremely important to identify which muscle is strained, as well as rule out other pathologies or injuries. Your physical therapist will perform a full evaluation of you shoulder and develop a treatment program that is individualized just for you. Frozen shoulder is an autoinflammatory process that causes inflammation of the shoulder joint capsule. Patients with frozen shoulder typically report a gradual loss of shoulder mobility (painless), followed by severe shoulder pain. In true adhesive capsulitis, no other pathologies are noted on MR imaging. While the true cause of frozen shoulder is unknown, patients with diabetes and thyroid dysfunction are at an increased risk for developing this pathology. Treatment – The entire course of frozen shoulder typically lasts 1.5-2 years. Research shows that physical therapy intervention with or without corticosteroid injections is extremely effective in decreasing the time to recovery. Your physical therapist will rule out other pathologies, initiate treatment for your recovery (manual therapy, stretches), and teach you which activities are harmful to your shoulder. 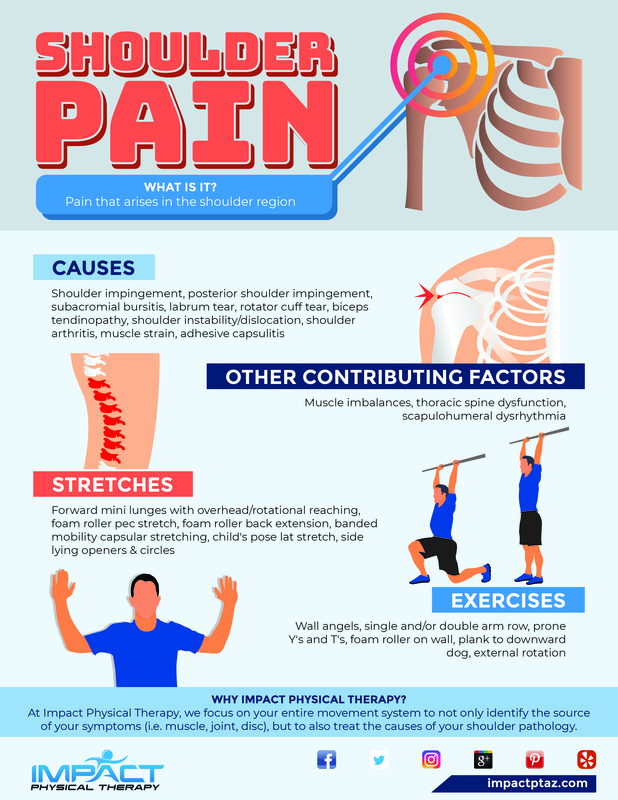 Whether you’re in shoulder pain or need some help with exercises and stretches, we’re here to help here at Impact Physical Therapy. We focus on your entire movement system to not only identify the source of your symptoms (i.e. muscle, joint, disc) but to also treat the causes of your shoulder pathology. Research shows that patients that participate in physical therapy before getting an MRI to save $4000 in medical imaging costs. To help, here is a list of new patient information so you can understand what to expect. We also treat active people and help them get off their pain medication. By treating the entire movement system, we reduce the need for injections or surgery. Following a physical therapy plan of care, less than 5% of our patients are referred to an orthopedic surgeon to discuss more invasive options (spine injections or surgery). It is our focus to get your body back to moving the way it was built to move without long-term complications that are often associated with surgery. Regardless of how terrible your pain feels or how bad your MRI looks, physical therapy is always an option! We are different than other clinics and are able to offer a full hour of one-on-one care with a doctor of physical therapy. We don’t use aids/assistants or charge more for specialized interventions (dry needling, instrument-assisted soft tissue mobilization, joint mobilization and manipulation, cupping, corrective exercise, etc.). Call us or click below to schedule your FREE CONSULTATION and feel better TODAY!